You are here: Home > News > Fire – A Foe of Belfast’s Built Heritage. The Ulster Architectural Heritage Society is deeply concerned by fire at 150 year old building at 16-18 Donegall Street, Belfast, Friday last, and again on Monday afternoon. The NI Fire and Rescue service are to be commended on the speed and efficiency of their response on Friday, which undoubtedly saved this building and probably others close by. It seems likely that damage caused on Friday may not have been sufficiently pleasing, and arsonist(s) returned on Monday to further damage this building. Despite the apparent double arson attack, intervention by the emergency services, means that the building appears relatively sound. Restoration should be possible and, indeed, is the appropriate response to such wanton damage to Belfast’s built heritage. Buildings in this area have been subject to extreme development pressure for some years with land and buildings ‘banked’ by various speculators leading to deterioration and dereliction in some instances. The land and property is now in the ownership of London firm Castlebrooke Investments who have recently revamped the former ‘Royal Exchange’ proposals, with a new application currently under consideration. UAHS strongly recommended that the earlier applications should not have been granted, and we similarly recommend that Castlebrooke’s current re-application is refused by Belfast City Council. Sentiments echoed by a large scale public campaign entitled ‘Save CQ’. Fires in historic buildings are much too common in Northern Ireland. An underlying and ongoing problem is that NI Fire and Rescue do not record statistics on fires specifically centered in historic buildings and the Fire forensic reports are not available retrospectively to the public. As it is also unclear to what extent the PSNI view as serious, fires thought to be malicious in ‘derelict’ historic buildings banked by developers, it is impossible to quantify the true extent of the cumulative loss to Northern Ireland. We believe Castlebrooke, and developers in general, should be asked to confirm that all historic properties in their ownership are secured in terms of services and access, and fully insured through ‘Empty Buildings Cover’. Buildings are surveyed and listed, and Conservation Areas are designated in the public interest, and at public expense. An insurance requirement should be in place to protect the public asset and investment. The Northern Ireland Executive is aware of the problem and former Environment Minister Alex Attwood launched a ‘Heritage Crime’ initiative but unfortunately without any apparent follow up or obvious benefit. Northern Ireland continues to suffer severe damage to the historic built environment through such fires. It is now for the Department of Communities to take up responsibility for this critical policy area. 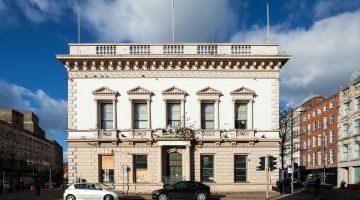 It is of note that an application was recently received by Belfast City Council for the demolition of historic buildings at 16-24 Donegall Street (to include the building burned on Friday and again on Monday) and 13-31 North Street, Planning ref: LA04/2017/2350/DCA. It is of further concern that the fires have occurred while this application is still being processed. UAHS advises that the proposed demolition of these buildings is against policy PPS 6: Planning, Archaeology & the Built Heritage. UAHS strongly objects to this application and encourages the public to join us in opposition to the wholesale destruction of Belfast’s architectural and associated social heritage. VIEW: the Planning Application for demolition of 16-24 Donegall Street & 13-31 North Street here. #HelpHeritage #HaveYourSay EMAIL: [email protected] Make sure to QUOTE: Reference Number: LA04/2017/2350/DCA.